The rupee, like its other emerging market peers, is giving jitters to equity investors and corporate India as well. Historically, stocks market returns were poor in years when the Indian currency depreciated against the dollar and vice-versa. 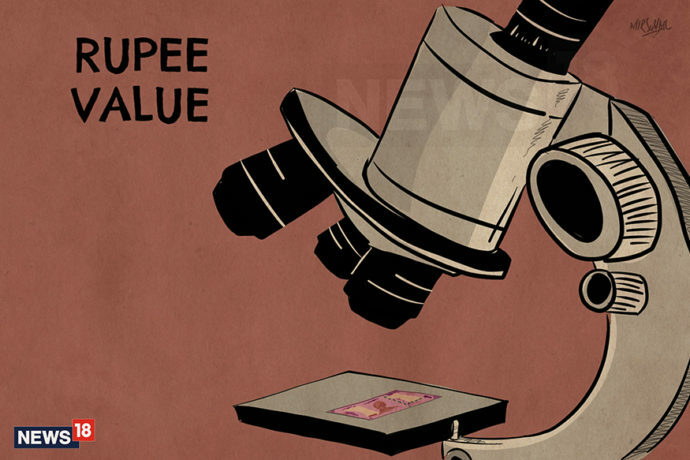 The rupee, on an unprecedented slide, is now starting to portray practical implications. National level import associations have written to the ministry of commerce expressing concerns on the depreciating Indian currency. They’ve also said that there are factions willing to stop import if rates are brought under control. “Imports are starting to become more expensive than ever before, it is upsetting expenditure budgets. We are also looking at taking a hit by not importing till the rates stabilize,” said a person aware of the development, on conditions of anonymity. This is not surprising, given that India’s imports consistently exceed exports. The rupee’s depreciation makes imports costlier, pushing up operating costs for companies and household budgets. The former hit corporate earnings while the latter has a negative impact on consumer demand, affecting the overall demand for goods. The rupee has sunk 11.6 percent so far this year versus the USD, set for its worst annual performance since 2011. The rupee fell as much as 1.3 percent to a new record low of 72.66 against USD on Monday. The direct result of the weakening can also be seen at shops selling imported fruits. Traders based out of Delhi and Mumbai have either cancelled their consignments or have brought down import quantity. According to them, the import cost has increased a lot in the last one month. A case in point being dragon fruit that was available at Rs. 500 to 600 per box, containing 30 pieces is now available at Rs. 2,000-2,200 per box. Similarly, cherry which is used at every sweet shop has seen around 60 percent rise in price. However, industry experts said that the Central Bank is not particularly worried about it. One of the primary reasons for RBI’s reluctance to aggressively intervene to support the plunging rupee is to check the sharp rise in imports especially that of electronic items like mobile phones, battery chargers and cameras that contributed significantly to widen the country’s trade deficit. A weaker rupee makes these goods more expensive, dissuading imports. Data sourced from the ministry of commerce showed such imports rose 26 percent in July on a month-on-month basis and by 29 percent when compared year-on-year, thus widening the trade deficit. Economic experts hinted that allowing the rupee to weaken could curb imports, thus capping the rise in the current account deficit (CAD). India’s CAD widened to USD 15.8 billion, or 2.4 percent the country’s Gross Domestic Product (GDP), in the quarter ended June, the highest in four quarters and up from 1.9 percent reported for the quarter ended March.